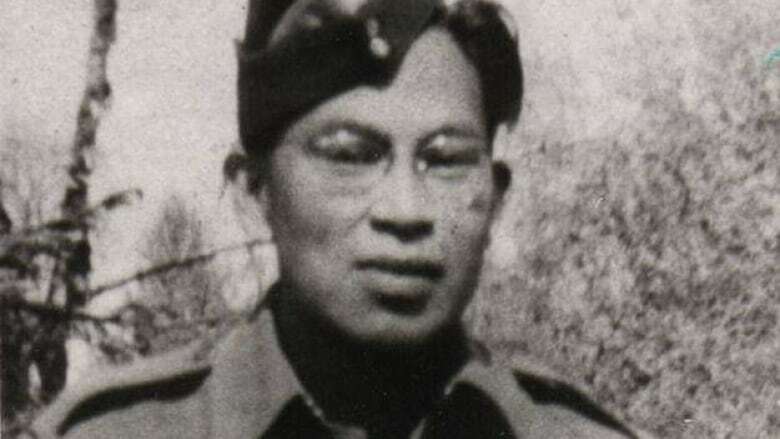 In August 1944, Edward Clutesi — of the Tseshaht First Nation — was killed while fighting in the Battle of Normandy and the retaking of Caen. He is one of thousands of Indigenous people who fought for Canada and is remembered on National Aboriginal Veterans Day. The stone — in the Bretteville-sur-Laize Canadian War Cemetery near the city of Caen — bears Clutesi's name, rank, military service number and age when he was killed in the Second World War. But what it doesn't show is that the 26-year-old was Indigenous, a residential school survivor, heir to one of his nation's hereditary chieftainships — and had a brilliant mind. "He was a chief; he died as one. And he had a high IQ and wanted to become a chemist," said his surviving brother, Albert Clutesi, who instead inherited the title. "It would have really been something, I think, if he came back home." Today marks National Aboriginal Veterans Day, which was first observed in Winnipeg in 1994 as a way to separately honour Indigenous contributions to Canada's military service. Stories like Clutesi's give a glimpse at those Indigenous soldiers killed in action — and what they aspired to be. Nicknamed "Fish," Clutesi didn't attend school until age 10, when he was sent to the Alberni Indian Residential School. "Mom went to residential school and she didn't like it, so she kept us out for as long as she could," said Albert. Once in school, Clutesi quickly showed he was highly intelligent, excelling in science and mathematics, with an aptitude for geometry, algebra and trigonometry. Clutesi's hobbies also hinted at his intelligence: he played the guitar and violin, and liked to sketch, drawing cartoon characters like Mickey Mouse perfectly. "Whatever he did, he was good at it," Albert said. "That's all he talked about: he was going to be a chemist," Albert said. "He'd have finished university. He'd have been Dr. Clutesi." In 1943, a group of Canadian soldiers practising military drills near Tseshaht caught Clutesi's eye. He joined the Canadian Army soon after. "It was like that saying in America at that time: Uncle Sam wants you," Albert said. "I didn't like it one bit. I used to read quite a bit about the war in magazines," Albert said. "A lot of [soldiers] got killed." Clutesi was shipped overseas to Europe, though he wrote his mother often. Albert later noticed something peculiar about one of his brother's letters. "That letter told everything — what he did, [that] he's going to the front," he said. But then those details were crossed out. "He didn't want our mother to know that he's going to the front. He didn't want to hurt her." 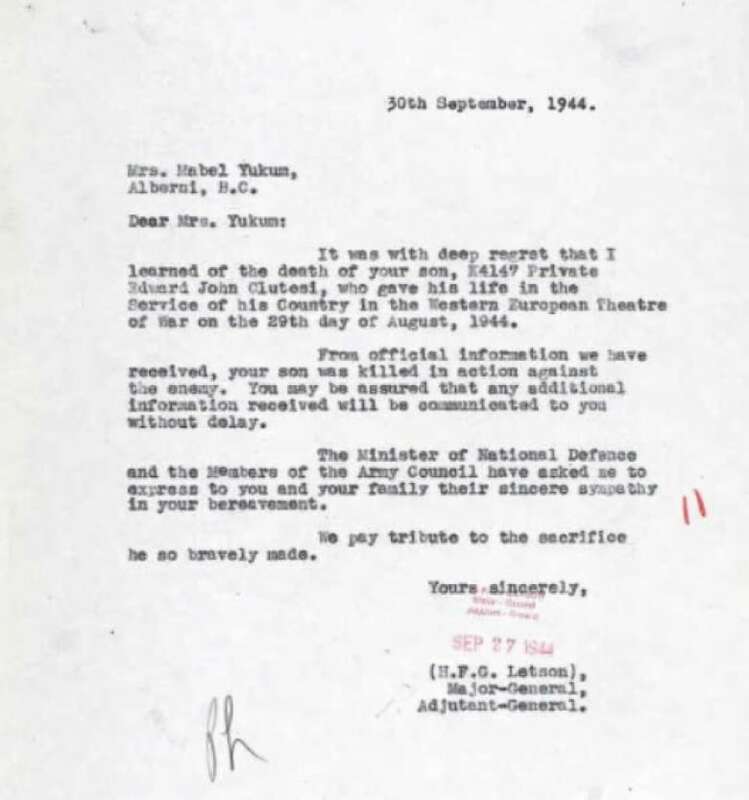 In August 1944, Edward Clutesi was killed in northern France while fighting in the Battle of Normandy and the retaking of Caen, one of Canada's bloodiest engagements. But the operation also marked the beginning of the end of the Second World War. "She said he showed up on her wall as a bright light and that she knew what happened to him," he said. "He was her favourite son and she truly missed him after." Albert's daughter, Isobelle, said her father talked about his brother from time to time while she was growing up; she knew that Edward Clutesi was smart, and that he had been killed in the war. "I remember being in the house my dad grew up in. I went up into his room and I saw military clothes and a hat that were his," she said. "I was small but it left a vivid memory." "I celebrated Remembrance Day for my uncle. It did something for me as a young person," she said. "I think it would have really made a difference, growing up in our family, to have some role model in our life," she said. 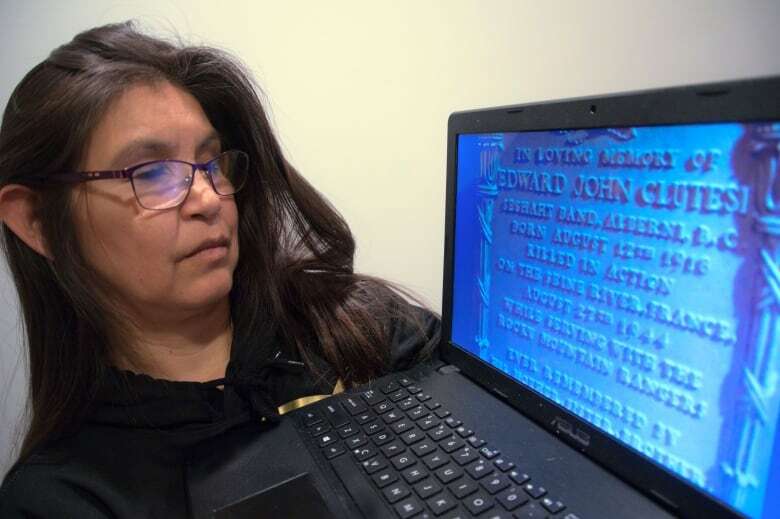 Clutesi's academic accomplishments are remarkable because Indigenous people rarely graduated from high school during that time, said Tseshaht Councillor Luke George, an Indigenous advisor at Port Alberni's North Island College who also served in the Canadian Army for eight years. 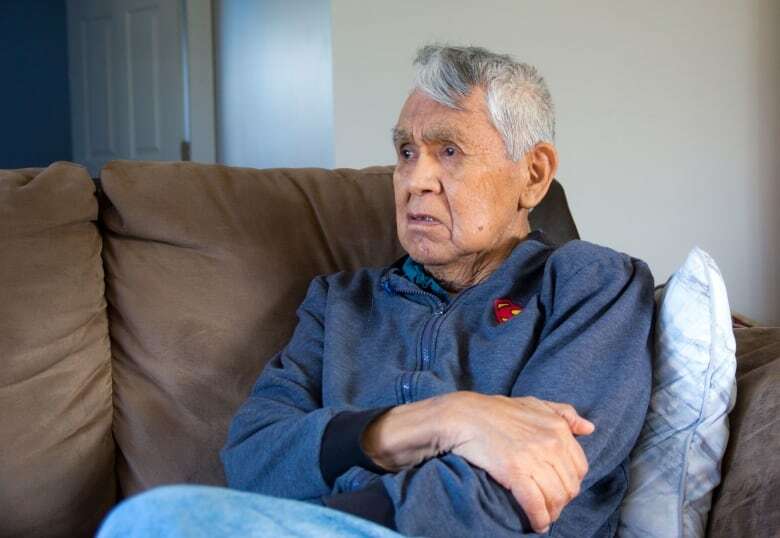 All the more remarkable, he said, is Clutesi's brilliance while in residential school. 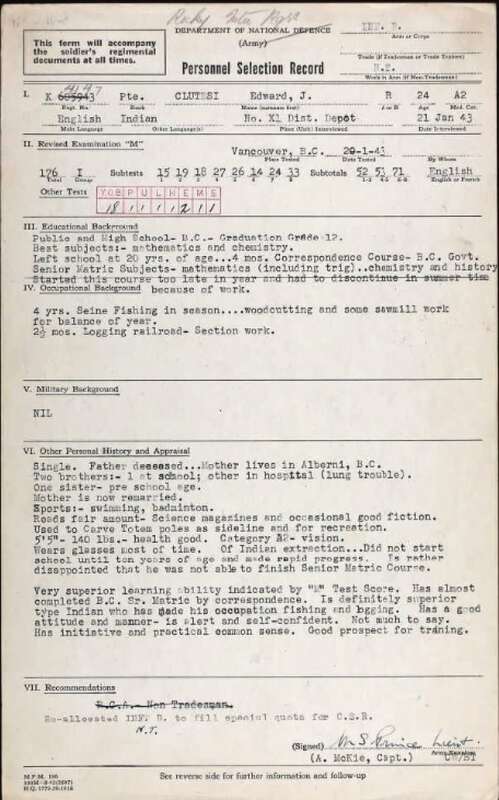 "He was a genius in spite of residential school, not because of it." "But as a Tseshaht member and councillor, I'm proud of him for serving our country."